Only the Catholic Church gets no respect. Recently, a notorious adult cartoon by Comedy Central, South Park, featured an episode, “A Boy and a Priest,” which blasphemously insults the Catholic Church by referring to Her as a cancer. Sign Here to Defend the Honor of the Catholic Church! The townspeople begin to worry and call the Archdiocese, which stated, “Oh, not another one!” More sexually obscene jokes were made that I cannot write here. But the main blasphemy is actually uttered by Father Maxi. This is a filthy blasphemy! How dare the producers of South Park refer to the divine institution founded by Our Lord Jesus Christ over 2,000 years ago as a cancer! Clearly, this is a cowardly attack on the Catholic Church. They are taking advantage of the all-out assault of the institution of the Church by the media. We cannot destroy the Sacred institution of Catholicism because of the sins of a few bad clergy. Please Sign Here to Defend the Sacred Institution of Holy Mother Church. Repeated reports of sexual abuse by ecclesiastics understandably provoke legitimate and healthy outrage. However, this outrage must be expressed carefully and sensibly. This does not mean that the Catholic Church can be mocked and blasphemed. In a recent episode of South Park, “A Boy and a Priest,” multiple blasphemous and sexually deviant jokes and attacks were made against the Catholic Church. 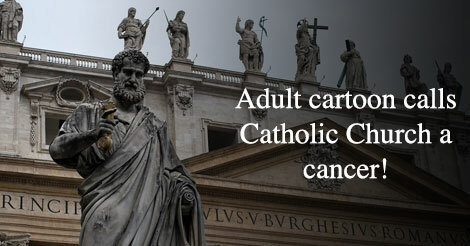 The worst was calling the Catholic Church a cancer. This is offensive to Catholics and above all Our Lord Jesus Christ because the reports of sexual abuse do not change the sacredness of the 2,000-year-old Institution. The Holy Roman Catholic Church has always taught that purity is the answer. I demand that you apologize for having offended over 1 billion Catholics and that you take down the episode.